The Capital District Region consists of the counties of Albany, Rensselaer, Saratoga, and Schenectady. In June 1984, the Capital District Regional Planning Commission (CDRPC), with the endorsement of the four counties and the Governor of the State of New York, petitioned the Economic Development Administration for designation as an Economic Development District (EDD). The original Overall Economic Development Program was prepared by the CDRPC staff in 1987 and has been reviewed and revised as necessary on an annual basis. To obtain input and guidance from the region’s public and private stakeholders, CDRPC convened a CEDS Strategy Committee in 2017. The primary role of the Strategy Committee was to inform CDRPC staff during the preparation of the CEDS by offering ideas, alternatives, and comments. The committee reviewed regional data; developed a list of regional strengths, opportunities, weaknesses, and challenges; reviewed and revised the goals and objectives for the strategy; and provided information to help develop the region’s priority project list. The work of the Committee is reflected in the final report. This CEDS reflects significant changes from past years. Based on guidelines from EDA, this strategy is more than an inventory of regional data and resources but instead identifies a clear vision, goals, and objectives. While we report some data in the document, we recognize that data is always changing and this information is only a snapshot while we continue to maintain up-to-date data on our website. It aligns our federal priorities with those of the state’s Regional Economic Development Council where feasible. The new CEDS also considers the need for resiliency in our economic development program. A 30-day public comment period began on December 13, 2017. The current CEDS was adopted on January 17, 2018. This update will include goals and objectives that are SMART in their approach. These goals and objectives will be specific, measurable, achievable, relevant, and timely. By doing so, we can better evaluate the region’s progress towards economic development and growth. In the 2017 CEDS update, CDRPC will incorporate items to address regional resiliency. 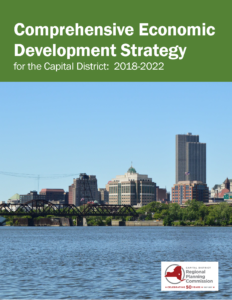 While we’ve been fortunate to withstand past environmental and economic shocks, this Comprehensive Economic Development Strategy considers some key items that will ensure that we are prepared to both respond and recover if one of these types of shocks were to impact the Capital District. In September 2012, the 2013-2017 Comprehensive Economic Development Strategy was approved.